Thursday March 6th 1884 I ironed in the forenoon after cleaning the house up and went to town in the afternoon. Hatt came home with me and stayed till after supper and John came over to go home with her. 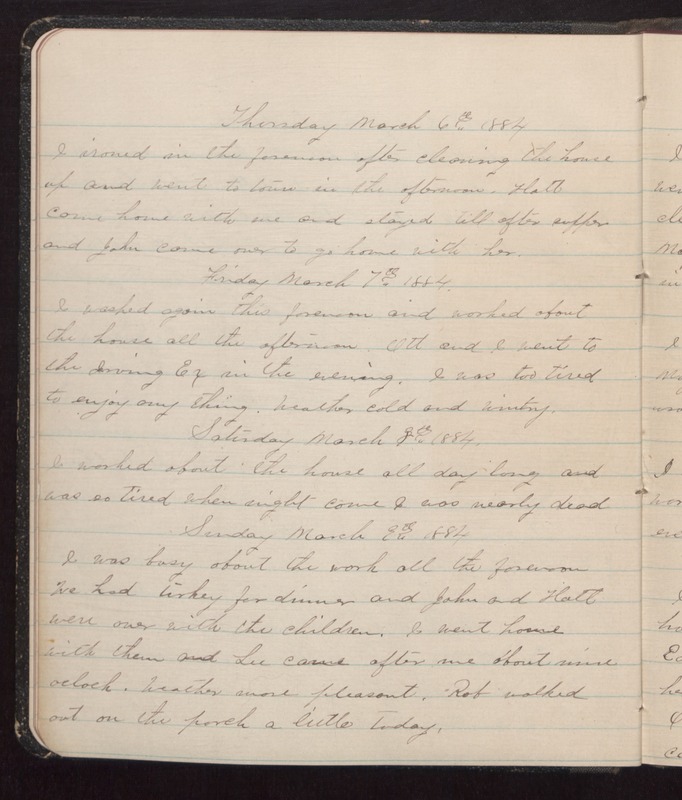 Friday March 7th 1884 I washed again this forenoon and worked about the house all the afternoon. Ott and I went to the Irving Ex in the evening. I was too tired to enjoy any thing. Weather cold and wintry. Saturday March 8th 1884 I was busy about the work all the forenoon. We had turkey for dinner and John and Hatt were over with the children. I went home with them and Lee came after me about nine oclock. Weather more pleasant. Rob walked out on the porch a little today.